RAMALLAH (Ma’an) — Israeli settlers uprooted dozens of olive trees, on Saturday, near Turmusayya village, northeast of the central occupied West Bank district of Ramallah. 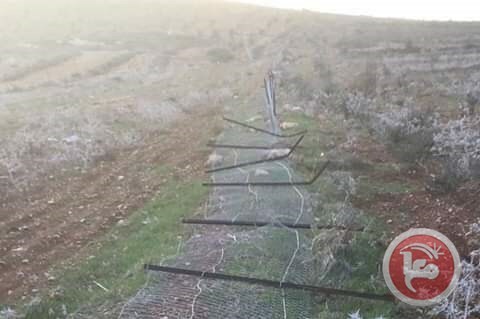 According to local sources, Israeli settlers under the protection of Israeli forces stormed the area and uprooted dozens of Palestinian-owned olive trees. Sources added that following the uprooting, Israeli forces arrived to the area and claimed that they opened an investigation regarding the incident, despite the presence and testimonies of the locals and owners of the uprooted trees. Israeli settlers constantly harass Palestinian farmers and residents in the village, in attempt to force them out of their lands, as part of an Israeli plan to expand illegal settlements nearby. According to a report by Israeli NGO B’Tselem, Israeli settlers’ vandalism in the occupied West Bank is a daily routine and is fully backed by Israeli authorities.